AUGUSTA (Georgia) • When Tiger Woods won the Masters for the first time in 1997, the first person he met when he came off the 18th green was his father, Earl. Twenty-two years later, when he won it for the fifth time on Sunday, it was his 10-year-old son, Charlie, and his 11-year-old daughter, Sam, who greeted him at the same spot. 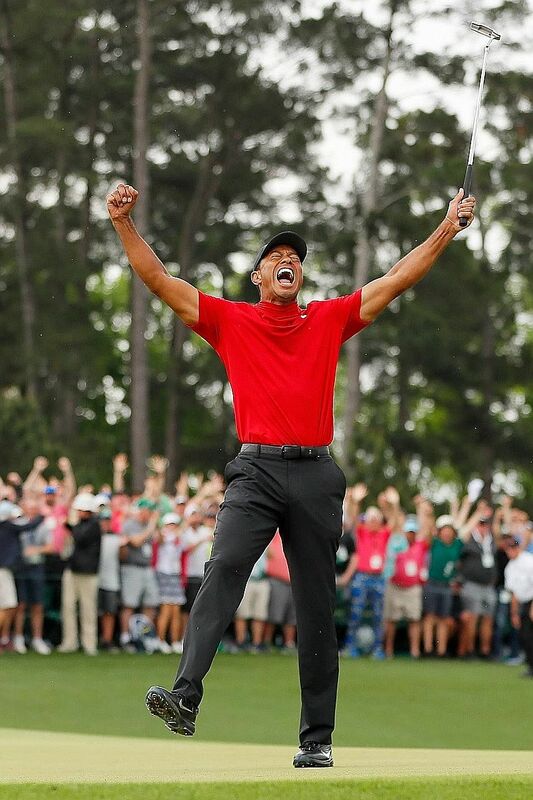 "It feels like I've come full circle," said Woods after clinching his 15th Major with a 13-under 275 total after a final-round two-under 70 at Augusta National. "My dad was here in 1997, and now I'm the dad with my two kids." Recalling their disappointment as he lost the British Open to Italy's Francesco Molinari last year, the former top-ranked player, who yesterday jumped six places to world No. 6, declared "he wasn't going to let that happen again". He said: "For them to see what it's like to have their dad win a Major championship, I hope that's something they will never forget." While Woods did not want to say exactly where this win ranked among his 15 Majors, he admitted "it's got to be right up there", along with his first Masters victory in 1997. Two years ago, he was not able to bend over to tie his shoelaces, let alone swing a club and his harrowing experiences with multiple back surgeries has left him grateful and "lucky to be able to do this again". The 43-year-old American said: "I had serious doubts after what transpired a couple of years ago. I could barely walk. I couldn't sit. Couldn't lie down. I really couldn't do much of anything." In 2017, surgeons fused two discs together in his spine, an operation that not only gave him "a chance just to have a normal life" but, as he soon realised, he "could swing a club again". •T iger Woods moved into a share of the lead at 11 under when Francesco Molinari's tee shot at the par-three 12th went into Rae's Creek and he made a double-bogey. • Molinari amazingly found the water again with a pitch to the 15th green as another double-bogey effectively ended his hopes. Woods made birdie at the same hole to claim the outright lead at 13 under. • Woods reached 14 under with another birdie on the par-three 16th where his superb tee shot almost yielded a hole-in-one. • He retained a two-shot cushion heading to the final tee and could afford the luxury of bogeying the 18th as he completed a remarkable win. Woods added: "I was very fortunate to be given another chance to do something that I love to do. More importantly, I've been able to participate in my kids' lives in a way that I couldn't for a number of years." It has also given them a chance to participate in his life, too. "The kids are starting to understand how much this game means to me, and some of the things I've done," he said. "They only knew that golf caused me a lot of pain. I struggled for years, and that's basically all they remember. Now we're creating new memories for them." Like his children, Woods' mother, Kultida, was at Augusta National, embracing him after he walked off the 18th hole. Although his father died in 2006, Woods revealed that he heard his voice at different points during the final round. He said: "On a couple of the putts, at the 12th and 13th, and especially the one on the ninth, I was thinking, 'Putt to the picture, just putt to the picture'. That's what he always taught me to do and that's what I just kept telling myself out there." The final round turned at the par-three 12th when Molinari put his tee shot into Rae's Creek, although there were still "so many different scenarios that could have transpired on that back nine". Joking that difficulty of the sport was why he is balding, he also got a little more serious when quizzed on whether he could press on and beat Jack Nicklaus' record of 18 Majors. He said: "I really haven't thought about that yet, I'm sure that I'll probably think of it going down the road. Right now, it's a little soon, and I'm just enjoying this one." Asked if he can continue to win at this level, Woods grinned before saying: "Yes. I do. Because I just did it."